Located around the world, Clarins Skin Spas are created as a tranquil place for a little me-time where you can escape for the very best facials and body treatments from skilful, caring beauty therapists. 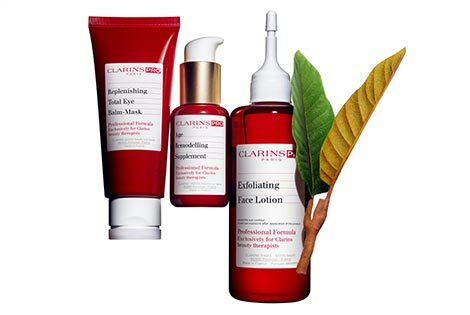 At the heart of Clarins expertise are plants with the most effective active ingredients. Our Researchers use the power of science to extract the natural beauty from the heart of each one, resulting in the purest, highest quality and the most effective botanicals. Every Clarins formula is the result of innovative research and effectiveness carried out in our Laboratories. Our products and application techniques are the fruit of over 60 years of dialogue with our clients. Clarins treatments are totally unique. They combine the power of the Clarins touch – a specialized and skillful massage – with the purest plant extracts and aromatic essential oils. The result is a blissful sensory experience that addresses the way you look and feel. At the Clarins Skin Spa, you’ll find that you are the most important person that your beauty and well-being comes first and that meticulous attention is paid to your every need and comfort. It’s your personal beauty space; somewhere super-accessible that you can escape to for the very best facial and body treatments from skillful, caring beauty therapists. Indulge in a 60-min Facial/Body Treatment at Clarins Skin Spa at just $90 (U.P $185) at Clarins Skin Spa at Wheelock Place. Every treatment is unique: personalise yours! The Beauty Therapist adapts her movements and the products to your needs and wishes. Ask about our available packages in-store. Experience Clarins expertise at a Skin Spa near you. Valid from 28 (Wed) Mar - 31 (Thu) May 2018. Applicable for 60-min Facial/Body Treatments worth $185 only. Not applicable for Mother-To-Be treatment. Promotion is only applicable to first time customers at Clarins Skin Spa at Wheelock. Prior appointments required and subject to availability. A 24-hour cancellation notice is required. Late arrivals will be subject to a reduced treatment time. Clarins reserves the right to amend the terms and conditions without notice. Clarins Pte Ltd's General Terms and Conditions of Sale shall also apply to the purchase of this package. Not valid with other promotions. Valid for one-time use at Clarins Skin Spa at Wheelock Place. A surcharge of $35 applies for Off-Peak packages utilised during Peak Hours. Off-peak hours are Mondays to Fridays 11:30am - 4:30pm (not including Public Holidays). Packages do not guarantee the service of any specific therapist. Any requests for specific therapists to conduct treatments shall be subject to the availability of the said therapists. The customer is responsible for ensuring that he/she attends, and is punctual for the treatment appointments. There is a 24-hr cancellation policy. On each occasion where notifications are made fewer than 24 hours before the scheduled treatment appointment, or where the customer does not turn up for the treatment appointment, Clarins Pte Ltd reserves the right to forfeit one (1) treatment from the respective package. In the event the customer is late for the treatment appointment, the applicable treatment time will be shortened. Alternatively, the customer may choose an alternative treatment of a lower value and shorter duration to replace the original treatment. Clarins Pte Ltd’s General Terms and Conditions of Sale shall also apply. All Prices are inclusive of GST and subject to changes without prior notice. *These treatments are available exclusively at Clarins Skin Spa at Wheelock Place.